St. John Eudes, C.J.M. 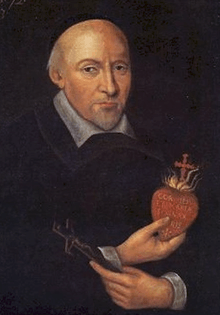 (French: Jean Eudes) (14 November 1601 – 19 August 1680) was a French missionary and priest, who founded the Congregation of Jesus and Mary and the Order of Our Lady of Charity, and was the author of the propers for the Mass and Divine Office of the Sacred Hearts of Jesus and Mary. He has been declared a saint by the Catholic Church. Eudes was born in 1601 on a farm near the village of Ri, in Normandy, the son of Isaac and Martha Eudes. After studying with the Jesuits at Caen, Eudes joined the Oratorians on 25 March 1623. 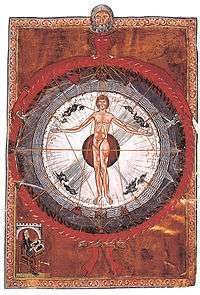 His masters and models in the spiritual life were Pierre de Bérulle and the mystic Charles de Condren. As a student of de Bérulle, Eudes is a member of the French School of Spirituality. The French School was not a system or philosophy, but a highly Christocentric approach to spirituality, characterized by a sense of adoration, a personal relationship with Jesus, and a rediscovery of the Holy Spirit. Eudes was ordained a priest on 20 December 1625. Immediately after his ordination, he came down with an illness that kept him bedridden for a year. During severe plagues in 1627 and 1631, he volunteered to care for the stricken in his own diocese. He went about Normandy committing himself to the sick, administering the sacraments, and burying the dead. To avoid infecting his colleagues, he lived in a huge cask in the middle of a field during the plague. At age 32, Eudes became a parish missionary, preached over 100 parish missions, throughout Normandy, Ile-de-France, Burgundy and Brittany. He was called by Jean-Jacques Olier "the prodigy of his age". In his parish mission work, Eudes was disturbed by the situation of prostitutes who sought to escape their life. Temporary shelters were found but arrangements were not satisfactory. A certain Madeleine Lamy, who had cared for several of the women, one day challenged him to address the problem. In 1641 he founded the Sisters of Our Lady of Charity of the Refuge in Caen, Normandy to provide a refuge for prostitutes who wished to do penance. Three Visitation nuns came to his aid temporarily, and in 1644, a house was opened at Caen under the title of Our Lady of Charity. Other ladies joined them, and in 1651, the Bishop of Bayeux gave the institute his approbation. The congregation was approved by Pope Alexander VII on 2 January 1666. It later also included a convent from which, in 1829, Sister Mary Euphrasia Pelletier established the Congregation of Our Lady of Charity of the Good Shepherd, better known as the Sisters of the Good Shepherd. With the support of Cardinal Richelieu and a number of individual bishops, Eudes severed his connection with the Oratory to establish the Congregation of Jesus and Mary (Eudists) solely for the education of priests and for parish missions. This congregation was founded at Caen on 25 March 1643. Normandy was the principal theatre of his apostolic labours. For the laity, Eudes founded the Society of the Most Admirable Mother, a sort of Third Order, which would eventually count among its members, Jeanne Jugan, the foundress of the Little Sisters of the Poor, and Amelie Fristel, who founded the Sisters of the Holy Hearts of Jesus and Mary at Parame, in France. The "Eudist family," is composed of the Eudists, the Sisters of Our Lady of Charity, the Good Shepherd Sisters, the Sisters of the Sacred Hearts of Jesus and Mary, and the Little Sisters of the Poor, and the Associates. Influenced by the teaching of the French school and St. Francis de Sales, especially as set out in the Treatise on the Love of God, and also by the revelations of St. Gertrude and St. Mechtilde, he was the theoretician, so to speak, of devotion to the Sacred Heart and explained the expressions of his predecessors. Won over to devotion to the Heart of Jesus by Bérulle's devotion to the Incarnate Word, he combined with it the gentleness and devotional warmth of St. Francis de Sales. He changed the somewhat individual and private character of the devotion into a devotion for the whole Church by writing for the benefit of his communities an Office and a Mass, which were later approved by several bishops before spreading throughout the Church. For this reason, Pope Leo XIII, in proclaiming his virtues heroic in 1903, gave him the title of "Author of the Liturgical Worship of the Sacred Heart of Jesus and Holy Heart of Mary". Eudes dedicated the seminary chapels of Caen and Coutances to the Sacred Heart. The feast of the Holy Heart of Mary was celebrated for the first time in 1648, and that of the Sacred Heart of Jesus in 1672, each as a double of the first class with an octave. He composed various prayers and rosaries to the Sacred Hearts. His book "Le Cœur Admirable de la Très Sainte Mère de Dieu" is the first book ever written on the devotion to the Sacred Hearts. You must never separate what God has so perfectly united. So closely are Jesus and Mary bound up with each other that whoever beholds Jesus sees Mary; whoever loves Jesus, loves Mary; whoever has devotion to Jesus, has devotion to Mary. The most striking characteristic of the teaching of St. John Eudes on Devotion to the Sacred Heart—as indeed of his whole teaching on the spiritual life—is that Christ is always its centre. He died at Caen on 19 August 1680. Eudes was declared Venerable by Pope Leo XIII on 6 January 1903. The miracles proposed for his beatification were approved by Pope Pius X on 3 May 1908, and he was beatified on 25 April 1909. He was canonized on 31 May 1925. His feast day is 19 August, the day of his death. The College of St. Jean-Eudes is located in Quebec. St. John Eudes Parish is located in Chatsworth, California. Wikimedia Commons has media related to Jean Eudes.